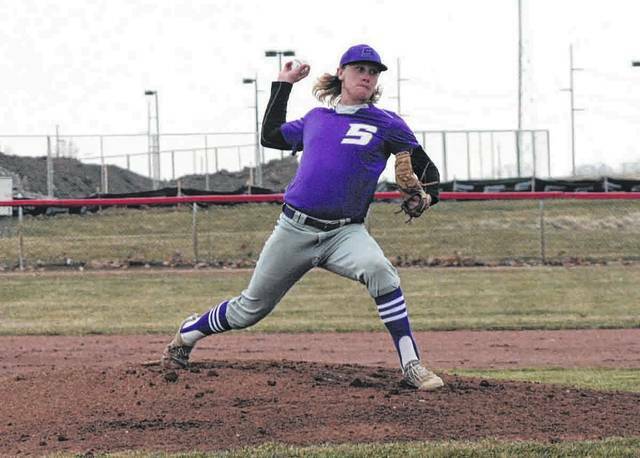 Roman Epley pitches for Swanton in a NWOAL game at Wauseon in 2018. He returns for the Bulldogs after being named to the NWOAL all-league first team a year ago. Michael Lawniczak of Swanton does work at the plate during a game last season. He is 1 of 10 seniors returning for the Bulldogs in 2019. 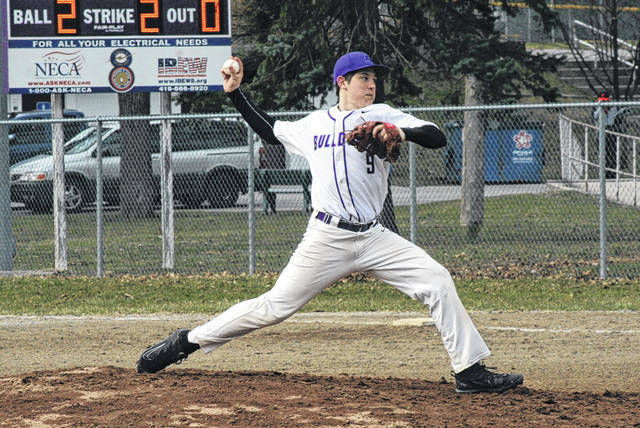 Swanton’s Austin Luce pitching in a game last season. The Bulldogs should have much depth on the mound this season. 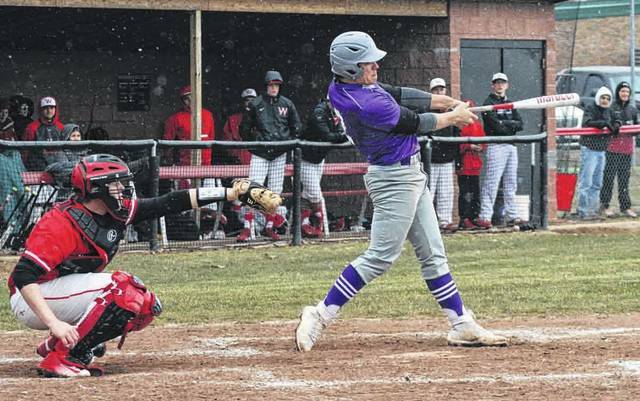 Swanton baseball aims to have another winning season in 2019, led by a group of 10 seniors. The Bulldogs posted a 14-9 record in 2018 with a 4-3 mark in the Northwest Ohio Athletic League, good enough for third place behind Bryan and Archbold. They reached the district where they dropped a tough one to Eastwood, 1-0. “We have a very experienced team with 10 seniors,” said head coach Tim McCarthy. “Once again we will play a very tough non-league and NWOAL schedule. I believe that will have us battle tested as we make the jump to a very tough D-II district. Returning to lead the Bulldogs are seniors Roman Epley (first team All-NWOAL in 2018), Michael Lawniczak (second team All-NWOAL), Hunter Mix (honorable mention All-NWOAL), Xavier Williams (honorable mention All-NWOAL), Austin Luce, Derek Floyd, Tommy Chonko, Jayde Kruzel, Carter Swank and Zach Zawodni. They also have back junior Billy Nowakowski and sophomore Devon Crouse. Perhaps the biggest returning piece both offensively and defensively is Epley. He hit .414 with a pair of home runs and 22 runs batted in last season. The senior also held a 1.47 earned run average over 39 innings pitched. Lawniczak, who was first team all-league as a sophomore, hit .292 with 14 RBIs and 25 runs scored for the Bulldogs in 2018. Also on offense, Mix posted a .342 batting average with 17 RBIs and nine stolen bases, while Floyd hit .277 with 16 RBIs. On the mound for the Dogs, Luce returns after boasting a 2.63 ERA over 24 innings. Kruzel is also back, as he finished with a 3.47 ERA over 31 innings in 2018. However, there are some weaknesses McCarthy hopes to clean up. The only departure for the Dogs is Bloom. But it is a big one, as he was first team all-league in his senior season. Despite just a 1-2 record, he finished with a 0.51 ERA and 40 strikeouts, allowing only three earned runs over 42 innings. If they can become more consistent defensively, and make up for the loss of Williams, Swanton can contend for a league title this season. Swanton opens with a game at home against Northwood this Saturday beginning at 11 a.m. The following Monday they host Evergreen in a non-league contest.